Hurricanes, tropical storms, and nor'easters are classified as cyclones and are any closed circulation developing around a low-pressure center in which the winds rotate counter-clockwise (in the Northern Hemisphere) and whose diameter averages 10-30 miles across. While most of Pennsylvania is not directly affected by the devastating impacts cyclonic systems can have on coastal regions, many areas in the state are subject to the primary damaging forces associated with these storms including high-level sustained winds, heavy precipitation, and tornadoes. Areas in southeastern Pennsylvania could be susceptible to storm surge and tidal flooding. The majority of hurricanes and tropical storms form in the Atlantic Ocean, Caribbean Sea, and Gulf of Mexico during the official Atlantic hurricane season (June through November) (FEMA, 1997). 13 Presidential Disaster Declarations, 4 Presidential Emergency Declarations, and two additional Gubernatorial Declarations have been made since 1955 due to coastal storm events in Pennsylvania. Hurricane Agnes (1972) was the most significant tropical storm event to impact the Commonwealth with losses near $3 billion. There has been an increase in North Atlantic hurricane activity since the 1970s with locations of peak intensity tropical cyclones migrating poleward coinciding with tropics expansion. For the Atlantic, the frequency of intense (stronger and with heavier rainfall) tropical storms is likely to increase (Kossin et al. 2017). 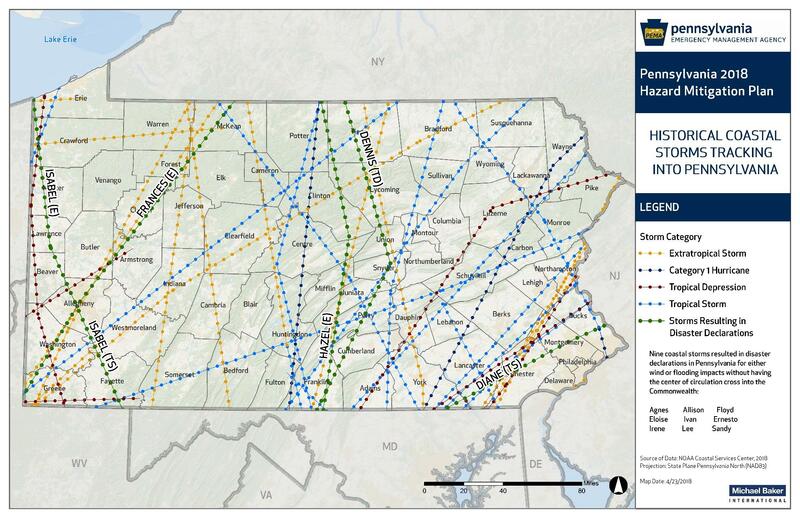 Hurricane frequency by census tract across Pennsylvania between 1851 - 2015 (FEMA NRI, 2018).